My mom was a 2nd grade teacher throughout my childhood. She was adamant that anything entering our home be educational. We were not big consumers anyway, but at her insistence, we learned to value books and board games over electronics, "record albums," and most of what Target now sells. Between her legacy, years of home schooling and a veritable degree in autism training, I have developed a similar tendency to seek out games and toys that either strengthen social skills, improve proprioception, stimulate sequencing and reading comprehension, desensitize tactile aversion, or something. Any purchase must pass through multiple filters. First, I must be able to justify it educationally. Then it must pass Reid's tough standards of being engaging and more entertaining than what he can conjure in his head. While Allie is our barometer on what is cool, pure fun or popularity is way down the list in my decision-making process. Instead, we evaluate based on whether the activity is visually motivating, offers concrete literal explanations, strengthens social skills, requires turn taking or develops critical thinking. We are loosening up now, but there was a time I purchased gifts based on how many IEP goals they addressed. I may have reached a compulsive level, you decide. Our cupboards and closets are filled with specialized products from stores like The Therapy Shoppe, SuperDuper Publications and Timberdoodle. They are far superior actually, but not always kid pleasers on Christmas morning. In Christmases past, our living room has looked more like moving day at a Speech/OT clinic than any child's dream come true. The Mind Your Manners board game went over like a lead balloon. Allie rolls her eyes recalling a time Reid sent me to Toys R Us to pick up a specific TeleTubbies video he'd earned (by behaving appropriately at the grueling all day Saturday CYT rehearsals). Unfortunately for him, it was out of stock so I made an alternate selection: Mister Rogers' What Do You Do With the Mad that You Feel. Poor Reid, when I gave it to him he was too stunned to cry. So it is, this Christmas, that I search for ways to make the Biblical reason for the season come to life in a concrete way in our home. Not with more stuff but with traditions and props that entertain while they educate about the historically significance of Christmas and the spiritual wonder. We are each giving 3 gifts to each other this year, dramatizing the three wise men who came bearing gifts to worship baby Jesus, the newborn King. You remember what they were: gold, frankincense and myrrh. Guess what I found at Trader Joe's? Myrrh toothpaste! Actually, it is myrrh, fennel, propolis toothpaste from Tom's. Wow, that is the perfect stocking stuffer or what? It meets all my criteria, with a hygiene component to boot. And it's gluten free so if the kids don't comply, Jim can use it! I bought a case. (Kidding:)) Allie was with me in the store. We ran across it as I granted her request for her own tube of toothpaste. "How bout this one? for Christmas!" I said in my glee at the discovery. "That's totally disgusting!!" she scoffed. Now, to show you how self-aware I am, I replied with a straight face, tongue in cheek, "What part don't you like--the propolis, the fennel or the myrrh?" At which, we both cracked up laughing. I did buy the stuff but, she is holding out for her own tube of Crest. Jim is wondering if we're trying to secretly embalm him since we learned that myrrh was used to prepare bodies for burial in Jesus' day. The myrrh actually foreshadowed Jesus' death on the cross reminding us that He came with the expressed purpose of dying for us. Try that on for an attitude adjustment each morning and night at the mirror. These object lessons are as much for us as for the kids. Apparently Reid is not the only one in the house who takes things literally. So yesterday I was at Jimbo's, our local whole foods grocery, and what to my wondering eyes did appear? But two bottles of aromatherapy oil in scents oh so dear! I sprung for the cheaper ones mixed with jojoba oil and now have an olfactory link to the ancient stable. Aura Cacia has got my number. They offer this object lesson-in-a-bottle with no seasonal marketing or fanfare just there for the taking, for those with eyes to see. They categorize the frankincense as "Sanctifying" and the myrrh as "Comforting" on the labels. I am using a few drops of it--in my car diffuser and lamp ring--to stimulate my Advent meditation before it gets popped into a stocking late Christmas Eve. It reminds me what the Bible says about our prayers reaching heaven like sweet incense and that we are the aroma of Christ to those around us. If you were a scent, which one would you be? Gold, I thought would be easy. Although since Allie and I prefer silver, I am not going for the obvious jewelry choice. I am actually still on the hunt for a gold incense box or bauble to put the toothpaste in? Or not. Perhaps at Whole Foods I can find some gold leaf sprinkles for the Nativity gingerbread cookies we make next week when there is NO SCHOOL! I'll keep you posted. Gotta go find gold that is fit for a king, The King of Kings. Elf is a favorite movie of ours this time of year. It's not about the real reason for Christmas--which I usually prefer--but it does tap into two of my special interests: adoption and autism. Buddy crawls into Santa's bag at an orphanage and ends up being raised by a very fatherly elf played by Bob Newhart. His dad honorably encourages when he wants to search for his birthparents in New York City...and is there for him when he returns. I get a kick out of Buddy, the elf, who has to learn the ways of what seems like a different planet. When he arrives in New York City, he has much to learn. Despite the warnings from his adoptive father that gum on the street is not free candy, he enjoys it all. How is he to know that waving people are hailing cabs not being friendly and the "world's best cup of coffee" is merely an overused idiom. Oh, how Carol Gray's Social Stories would help him or Michelle Garcia Winner's You are a Social Detective book or a book on idioms! Like those articulate adults on the autism spectrum who liken their experience to being anthropologists from Mars or citizens on the Wrong Planet, Buddy will have to study hard and have many tutors before he can even pretend to be "normal" or fit in. Innately, he is not at all bad though. Actually, his honesty and sweetness are refreshing to some. His idiosyncracies makes him vulnerable though, to others and are a social obstacle to overcome. Countless moments come to mind when Reid has done quirky and "socially inappropriate things" (that's how you get the diagnosis, after all). Depending on your prerogative the things on that list can range from being appalling to endearing. I am the first to correct him, sometimes. Other times, I like to enjoy the luxury and gift of sitting back and purely accepting, appreciating the unique creation that he is, his magnificent mind, and his own perspective on the world. I recall once during a church service when he was giggling, flirting, and practically dancing with the woman behind us. She is now a friend who I know, trust, and love but, at the time I hadn't met her. Feeling responsible to uphold his "program goals" and maintain the decorum of the service, I kept shushing him and using those not-so-magic words like, "quiet voice," "eyes in front," and who knows what else. Their shenanigans continued. Clearly, both were enjoying the interaction. This animated woman was instigating him not to mention distracting from my effort. I was torn between the two sides of my love. The soft side wanting to encourage their soul connection and get her phone number; the hard side towing the line on behavioral reinforcement. These are the kind of internal dilemmas that give me neck pain. He really wasn't doing anything morally wrong. In fact, one could argue he was setting a better example than others of hospitality and worship by giving his whole self in the moment. What's a mom to do? Love unconditionally or train toward independence? Both, in turns I suppose. Maybe this Christmas for just a day or even a hour, while school is out and no one's looking, let's let our kids be who they are without any correction. Let them refresh our perspective on the planet and the kingdom. 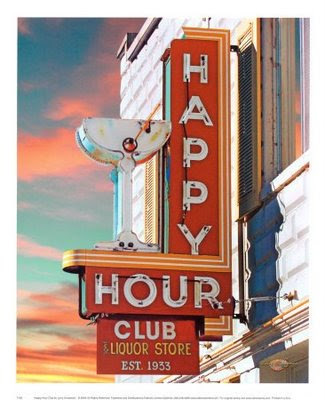 Does your public library have a Happy Hour? Countywide, on the last Friday of every month, at every branch, ours does. Alcohol is not served; everyone's just very happy to return late materials with no fines whatsoever, no questions asked, no due dates checked, no snickering. Thirsty one day, and not at my usual branch, I noticed the sign on their counter. Not to be believed! Could this be? I inquired. Yes, indeed, they would rather have their books back--no matter how late--than leave them missing in action. They waive all fees, even their potential profits from replacement fees. I had incurred upwards of $50 a month before this happy time. This was very good news for me! My husband jokes that I have lost library privileges in every state in the union, which is not quite true. We haven't moved that much! What is true, is that I am frequent library user, a horrible procrastinator and an avoider of conflict (Harmony). So, when I have books that are more than a couple days late, I go into avoidance mode feeling I can't show my face at the local branch. I bury my head shamefully in the sand while the fines steadily increase, like a taxi meter headed for the airport, finally exceeding replacement value. Of course, loving books as I do, I eventually own up and pay the exorbitant fines, considering it a good deal compared to the equivalent cost of much shipping and handling at Amazon. The library is certainly a good cause. Until I learned about Happy Hour! Now, I mark my calendar for the last Friday of every month, anticipating another new grace period, while I search under mattresses and behind furniture for the rogue book or tape. The library has long been my favorite institution, all the moreso now! Between my over-consumption of books and Reid's penchant for stickers and de-constructivism, we have tried the patience of many a librarian. When we were home schooling I would routinely check-out a stack of 15 or more books. Allie had her own stack; maybe she could carry 8 in those pre-backpack days; and Reid got books then too (not movies). Most of our weekly loot, I had requested online from other branches in order to keep the county employees busy pulling titles at every branch in the system, trucking them across town for my convenience, and flagging them with my name on a special shelf. (This is a commonly available service at most libraries, although not widely publicized.) I was compulsive about gathering resources that correlated with each of our unit studies or whatever curriculum-of-the-month I was using. If that wasn't enough to rebuff the proverbial Marian Librarian, Reid was infamous for obsessively removing stickers from library property. I didn't think of it as criminal when he was young (neither did they). It just irked him to no end that they obstructed the illustration and text on the covers of books and boxes of CD's and DVD's. When forced to pay $1 a piece, one is quickly aware of the astonished array of stickers they use on one library book. There's the barcode, of course, then the color-coded juvenile tag, genre stickers, branch letters, alphabetical filing tags and sometimes a donor acknowledgement. "Why oh why oh why?" I asked myself many a time, as we'd recreate their placement on the gummed up vinyl, en route to ditch them in the return vault. (Maybe Amazon is better?) In Reid's mind, they all had to come off so he could see the information he cared most about: the production studio and ratings or the author and copyright. For both these reasons, the library was our family's version of Cheers!, a neighborhood place where "everybody knows your name." I was there yesterday, my slate having been freshly cleaned. A new clerk scanned our selections at the desk. I know she's new because she didn't know Reid or me. They all know us and we know all of them. "It's such a good feeling," as Fred Rogers would chant. So, when there's a new hire, it feels strangely rude not to introduce myself. Yet, to do so, seems just as oddly presumptuous. Why should she should recognize us, yet? In this case, bubbly Joanie walked over to do the honors. Wishing me a hearty, Happy Holiday!! with a two-handed handshake (it's impossible to hug across those wide counters) she intervened, "Have you met Mim?" In short order, we were introduced. I'm not sure Mim will remember my name, but she will remember the title Joanie assigned us, "She's our best customer!" Now I've heard Joanie call other people this, but I must say I swell with pride, just the same. In mock humility, I joked that I was definitely their highest paying customer. Surely, I must be underwriting a renovation or expansion or something they're drafting. At that point, the head librarian chimed in, "yes, see that whole wall over there? It's hers!" So, you see, I have not lost any privileges whatsoever. Like a flagrant credit card user, I am all the more revered. In fact, they want to increase my credit limit. After Reid destroyed one too many DVD cases, they designed a special system for the Moriarty family. We got our own thick, plain white, vinyl 5-disk case in which to carry disks home and back. 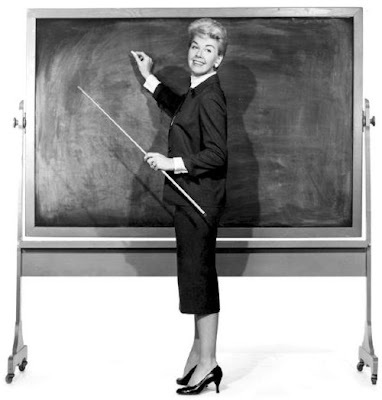 This required additional training of all the staff (much of which I did pro bono. They kept the DVD box and artwork encrusted with its priceless (to them) and annoying (to Reid) barcode and inventory stickers; we got the movie. At that juncture, I told them I'd almost rather they revoke our privileges, so Reid would experience the natural consequences of his peeling fetish. "Oh, no, no, no, no, no, we don't want that," they cried in unison. "We need the circulation numbers." Apparently, circulation numbers drive their budget. The more titles people check out, the more county money they are allotted to purchase new materials and enhance their collection. Now I see why they love over-users like us. When I carry a debt at the library, my heart is heavy. I feel banned from my favorite place to browse and choose books. Trapped at home, unable to find my Get Out of Jail Free card (the missing book) I enter a stubborn refusal to pay for something I only intended to borrow. Grounded from a favorite activity, then a paralyzing guilt of neglect and tardiness set in. Chastising myself is depressing and being angry at Reid for his part in it, is not productive. Now, I don't want to over moralize this but, isn't sin just like that? Happy Hour sets me free! Last time, I was visibly uplifted, walking out to the car with a fresh stack of free books! The parallel hit me with the salt air; Jesus forgives and forgets our iniquity. He gives us privileges back; the right to pray to Him and be heard without obstruction; the carefree feeling of innocence and childlike faith return; the squeaky clean shine of having unrighteousness removed as far as the east is from the west. The only difference is that His happy hour can be daily or hourly, as needed. Yesterday and the day before, Reid and I were searching, searching, searching for the 3-disc Fraggle Rock set we'd borrowed the day my sins were washed away (November 28). 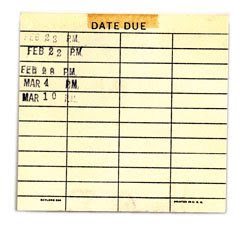 Videos being 7-day rentals, it was due back this Friday, library day. Yikes. Trying to repent from my wayward ways and demonstrate real improvement after a recent reclusive hiatus, I told Reid, "we can only go if you find Fraggle Rock." I was determined to keep short accounts and stay "in the black" this month. I tucked him in saying, "let's ask God to show us where it is. He sees everything and He knows where you left it." We prayed in earnest and turned off his light. I no more than stepped into the hallway as an "aha" popped into my mind--the laundry basket! There it was, buried halfway down. Saved again! Praise God, He wipes away our sins, gives us third and fourth chances AND answers prayer. We returned it today as an even exchange and I have library privileges out the wazoo, thank you very much. "Blessed are those whose transgressions are forgiven, whose sins are covered. ...as far as the east is from the west, so far has he removed our transgressions from us. Jim and I had a pretty traditional wedding with one exception. 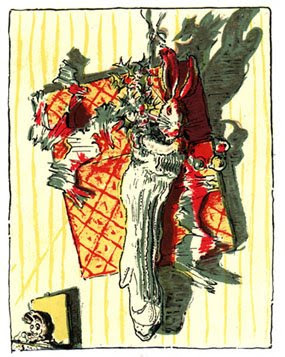 In addition to Scripture readings, we had one of my college advisors read an excerpt--about "becoming real"--from The Velveteen Rabbit by Margery Williams. For whatever reason, I first read this book as a college student, not as a child. At that age, Jim and I prided ourselves on being transparent, vulnerable, honest, real. He liked me best without make up; I knew he was no poser. I read the book to our kids when they were little and choked up at the new significance of this allegorical tale. It is a parable that goes way beyond the ostensibly sentimental story. It offers numerous applications on acceptance, motherhood, the power of love, and unconditional relationship. So many that another book, The Velveteen Principles, has been written by Toni Raiten-D'Antonio to analyze and put it into adult terminology. Listen between the lines to Meryl Streep's sensitive reading of it with music by George Winston. When read with integrity, life experience, and heartfelt belief it still moves me. The Lord has done a great deal of humbling in both Jim and I since 1986. We thought we were "real" then, let me tell you, it's all relative. Some wear and tear comes from the inevitable passage of time, relocating frequently, and becoming parents. Even more comes from being the responsible party for someone who is impulsive, inappropriate, embarrassing and at the same time, naive, well-intentioned and so precious to us. Whether you have a "spirited child," a "challenging child," a "special needs child," an "out-of-sync child," or an "indigo child," it is a high maintenance job! We are like EMT's or firemen who have acclimated to crisis mode. We become light sleepers, quick thinkers, fast actors, and smooth operators. No matter what happens we remain calm, consider all possible outcomes, and drive carefully but quickly with our sirens blaring. I think the Biblical word for "real" would be sanctified. If the velveteen rabbit was saved by the boy from being left outside all night, we are saved by God and redeemed from the pit. Then bit by bit, loving and being loved to tatters, progressive sanctification happens. As we die to sin and live for Christ, we become more like Him. It is not about our salvation; it’s about how we live after we’ve been saved. “Does it hurt?" “Sometimes,” said the Skin Horse, for he was always truthful. You bet. People laugh. People point. People blame. You get hit. You get bit. You are tired. “When you are Real you don’t mind being hurt.” “Does it happen all at once,” he asked, “or bit by bit?” He will be fine. We can do this. I know he'll get better. Why me? What do I do? I can't do this. What will the future bring? The skin horse shares, "It was the boy's uncle who made me real." For us, it is Jesus who makes us real. Real enough to run wild as march hares into eternity, liberated from sin and the sawdust of our fleshly existence here. It is He who understands when others don't and loved us enough to shed his own blood in our place. We can't be ugly anymore. We are a new creation. God sees us through the blood of Christ and in His perfection. No longer shabby sinners but beautiful, perfected, sanctified, clean as the driven snow, pure like the lamb of God. Keep it real, friends. God, who got you started in this spiritual adventure, shares with us the life of his Son and our Master Jesus. He will never give up on you. Never forget that.